Research shows that 69% of online visitors are leaving your ordering funnels without completing the order. However, increasing conversions with only one percent can mean huge increases in new leads, revenues and profit. Unfortunately, many digital marketers are not leveraging the power of customer feedback to increase online sales, despite 38% of customers being willing to give feedback after a negative experience (Temkin Group). At the most basic level that is the whole process! Every approach needs to cover these three points but I believe introducing anything extra at this stage is unnecessary and potentially distracting from the task at hand. Retailers always need to be able to identify customer issues during the order process, after all this is the stage where you are most likely to lose (or hopefully retain!) orders from your website visitors and customers. Online feedback collection tools make it much easier to not only collect feedback but also to keep it relevant and timely in the real world. This is relevant in the sense that they are triggered based upon visitor behaviour and ask short and simple questions why a customer is not proceeding in the funnel. Being hassled with questions that are irrelevant won’t endear customers to your business! Before you even start to plan or implement feedback technology it is important to look at exactly what it is you want to achieve through collecting feedback. Broadly speaking, this will likely be to increase online conversions by listening to your customers and ensuring you stand out from the competition, not only on product and price but also in ease of use. If a visitor has trouble reaching his goal, he will go to a competitor’s website in the blink of an eye. An excellent way to do this is to identify where visitors are leaving your ordering funnel (exit behaviour). The next step is when customers exit the process to present them with a relevant feedback question. A customer is far more likely to offer useful feedback at this stage because apparently they are interested in your product or service. Equally, this approach can offer invaluable insights when a customer abandons a full shopping cart, or keeps going backwards and forwards through the funnel. The issue could be price (perhaps they have found the same product cheaper somewhere else, or the delivery fees may dissuade them from completing the transaction, or perhaps there is a glitch in your website) – whatever the reason it is vital that you are aware and can rectify any issues. Besides looking for exit intent, it is useful to provide visitors with a passive possibility to give feedback. With passive I mean a button or a link (for example with the text “help us improve” or “please give your feedback”) that the visitors decide to click on themselves. 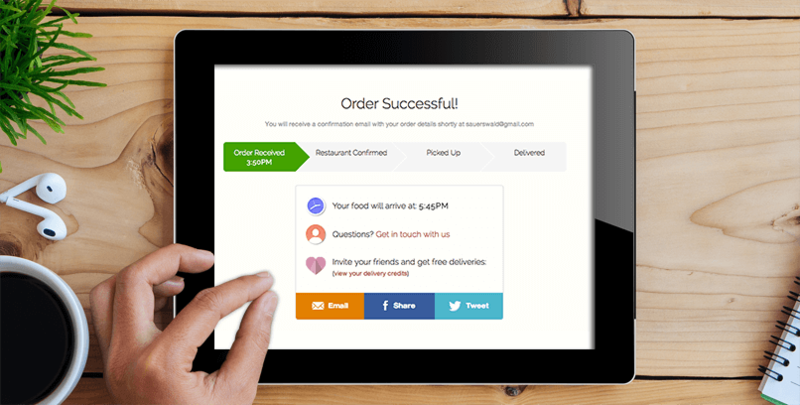 When they click the button a short dialog appears where they can submit their feedback and provide you with useful insights on your ordering process. In many cases (an average of 23% in our own experience) they are willing to leave their contact details as well. Another useful place to ask for feedback in the ordering process is to embed a feedback possibility at the end of the funnel. Usually this is the confirmation page that a visitor reaches after successfully placing an order. You might ask yourself, why here – they have bought the product already? Well, even if they placed their order successfully – and I know, the sound of a sale is an exciting moment – it doesn’t tell you anything about how much effort it took the customer to succeed. They could have had quite a struggle to reach the end of the funnel. My experience is also that the willingness to give feedback is quite high at this stage and the information is incredibly valuable. If the feedback collection is implemented correctly, feedback covering your ordering funnels will be flowing in. The next stage is making sense of the customer feedback data, which is just as important as collecting the data effectively. Ideally, this involves rapidly sorting through feedback and identifying trends, rather than simply singling out individual cases. This is especially important when feedback volumes are increasing, and feedback is coming in from multiple online sales processes, where this can be quite the challenge. You need to be aware of the critical steps within your sales funnel and the potential fallout when these fail – customer expectations are a highly useful metric to consider as well as your business performance. In your feedback analysis it is important to relate feedback – both your metrics/scores as your open ends – to the right steps of the funnel. For example, if you have a lot visitors leaving during the funnel step where they have to fill in their contact details, you need to know why. Reporting on funnel steps also means it makes it easier to track improvements. When you and your team decide to improve a certain part of the funnel you want to know what the effect is over time. Of course more sales is an important indicator, but you want to know if complaints or feedback volumes have decreased over time related to the improvements you have made with your feedback. Identifying where customers leave the funnel and why will often depend upon fully understanding this feedback and looking at it in a wider context. The levels to which you drill down through the feedback criteria is very much dependant on the business and its needs for a specific investigation. Using an effective feedback solution will let you design the criteria to be relevant to your customers as well as to your needs, saving huge amounts of time and effort over a manual search. Good reporting also needs to alert the right teams and individuals within your organisation with the right information. Product pricing issues need to be addressed by your e-commerce managers and product managers, whilst technical issues need to be directed back to your web development and IT teams. It is also extremely beneficial to ensure front-line customer service teams are rapidly alerted to any issues, so they can act to placate and help potentially frustrated customers. When collecting larger amounts of feedback data it might come in handy to use more specialised tools to analyse text and sentiment. A simple start would be to use Excel or a word cloud to see which words occur most. When using more advanced tools you will be able to combine text analytics with sentiment analysis. For example, which words are used most, and in combination with which others? Also how is the sentiment evolving over time? Positive, neutral or negative? If you take things one step further you could also automate learning capabilities to identify topics or issues that occur most and use machine learning to automatically assign feedback to these topics. When used correctly you will also be able to see how these topics behave over time – for example, are certain topics getting more or less feedback and is the sentiment for an issue changing over time. With collected feedback and effective reporting it’s time to take any necessary action – yet all too often organisations fail to close the feedback loop. With the right process in place you can engage with at-risk customers immediately, to improve your chances of stopping them purchasing elsewhere. Taking the right action also requires the organisation to understand the market, its clients and its business proposition very well. If key teams or people within the organisation struggle to do this, all the feedback in the world would simply fall on deaf ears. Closing the feedback loop means your business benefits from this information. This might involve lowering your price, offering additional benefits or some form of special offer for buying additional units as part of a special deal. In some cases, it might even mean withdrawing the item and concentrating on other products if it becomes uncompetitive. Customer feedback arms your organisation with relevant and timely information, so you can react and make the right choices to stay competitive and outmanoeuvre your competitors. Looking at the basic three pillars of optimising online sales with customer feedback will give you a clear strategic view. Collecting and interpreting customer feedback can be an overwhelming exercise, so you need to know exactly what you want from the end results and what action may need to be taken to improve matters, otherwise it can rapidly become simply a vanity tool. Advances in intelligent software have made the effective management of customer needs and sales optimisation much easier, but there also needs to be a firm understanding of the basics. Knowing when a well-targeted interaction with customers is required (and when it can be an annoyance!) is the ideal solution and one which is fully achievable with the right planning and full collaboration by all the stakeholder departments within the business.